In an era long before this internet age, Rajesh Khanna was the man who sparked a frenzy never seen before and never since, not even by the likes of Amitabh Bachchan. In the 1970s his very name was a magical charm that sparked hysteria, particularly amongst his legions of women fans, who would line the road for a glimpse, chant his name, cover his car with lipstick marks and even write him letters in blood. They married his photograph, cut their finger, applied sindoor mark with their blood! Let us look at what makes causes this huge popularity that makes the minds of so many swoon. Gemini Lagna with a parivartana between Mercury and Jupiter holds the promise of a huge rājayoga that promises great fame and popularity. Parāśara says that that lagneśa in 7th bhāva can give rājayoga if it is strong, which normally it isn’t in most cases. What we need to check is if the dispositor of the lagneśa i.e. the seventh bhāva lord is strong. This specific yoga shows the blessings of हर (Hara), a form of Shiva. Since lagneśa Mercury is in Sagittarius, we find that its dispositor Jupiter is (a) in Lagna in digbala showing the blessings of Iśāna-digpāla devatā and (b) is also retrograde in kendra being full of rays (c) besides being vargottama, bringing forth a great blessing. A similar condition is seen in the chart of A. R. Rahman who has the same Jupiter-Mercury exchange for Gemini Lagna that gives him such great fame from the blessings of a sufi saint. Even the chart of Steve Jobs which has lagneśa Sun (Leo Lagna) in the seventh bhāva in Aquarius, has dispositor Saturn exalted in Libra creating this rājayoga from Hara-Shiva. There are many examples where the unstable yoga of lagneśa in the 7th bhāva has changed to rājayoga due to the strength of the dispositor. For celebrities, the image called ‘āruḍha’ in jyotiṣa, is all that really matters. For Rajesh Khanna, it was all about charisma. His unique dialogue delivery with strong personal emotional body language of crinkling his eyes and head tilt that were all his own natural ability, got female fans swooning while men were full of admiration. The āruḍha is in Pisces and all that was said for Jupiter equally applies to the āruḍha. 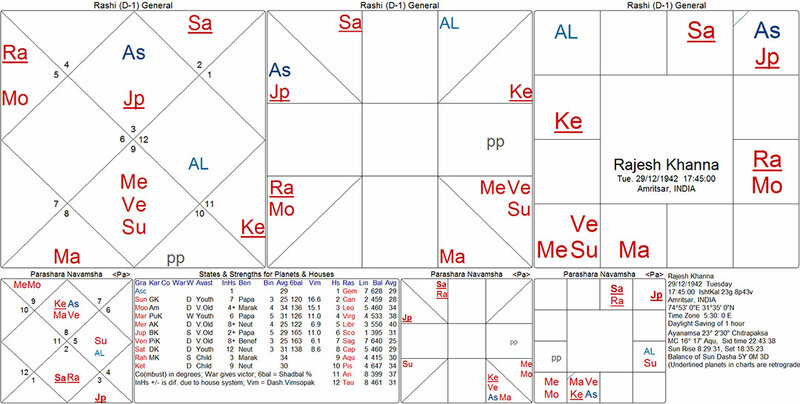 Jupiter connecting the āruḍha (Pisces) and Lagna (Gemini) indicates there was a certain honesty about Rajesh. He was what he portrayed – no false pretences. The Dvisaptati Sama daśā applies for timing his Career as Lagneśa is in 7th bhāva in addition to 7th lord being in lagna. We have shown previously that ‘malefics in strength and benefics weak in the 6th house from Āruḍha Lagna give powerful rājayoga in Kali Yuga’. Rāhu and Moon are in Leo in the sixth from āruḍha lagna. Rāhu is very strong in exalted Taurus navāṁśa which is also the sign in the tenth bhāva from the natal Moon in Leo (professional direction). Merc: 2004-07-05 – 2013-07-05 Saturn vargottama in Taurus (10H from natal Moon in Leo) gives bad reputation and during Saturn daśā, even after winning the 1965, All India Talent Contest organised by United Producers and Filmfare, he was called (फ़ाल्तु) fāltu or useless-hero after his debut with Aakhri Khat in 1966. But Rāhu daśā changed everything and his talent and fame knew no bounds. Glory and fame galore came his way with the two 1969 films – Aradhana and Do Raaste – where he teamed up with two of his best co-stars, Sharmila Tagore and Mumtaz, respectively. Rāhu daśā started in 1968 and within a year both the films were super hits and Bollywood’s first superstar was born. Between Aradhana in 1969 and Prem Kahani in 1975, Rajesh Khanna enjoyed a god-like status given by a powerful ninth lord Rāhu in 3rd bhāva from Lagna, placed in 6th bhāva from āruḍha in exalted navāṁśa and conjoining the Moon, which can be taken as co-lord of Taurus while aspecting Venus, the lord of Taurus. Popularly called ‘Kākā’, Rajesh Khanna still holds the record of consecutive solo super hits in the 1970s when he starred in mega hits like Safar, Kati Patang, Sachaa Jhutha, Aan Milo Sajna, Anand, Amar Prem and Mere Jeevan Saathi. Mars and Ketu yoga which is piśāca yoga that causes the brains of self and others to stop functioning properly causing awkward reactions and a kind of madness which is difficult to explain as rational. Consider the women who bled their fingers and applied blood-sindoor mark after marrying his photograph or those who left a thousand kiss-lipstick marks on his car. Mad hysteria seizes his followers. Venus and Ketu yoga which is tapasvi yoga or gandharva yoga depending on whether Ketu or Venus is stronger. The navāṁśa chart is dominated by this vaitānika yoga of Venus, Mars and Ketu in Scorpio Lagna. Adolf Hitler too had vaitānika yoga and his followers became equally mad. The difference lies in the other kendra where the native interacts with society. These tell us how the native is using this popularity and power of the vaitānika yoga. Rajesh Khanna has a strong Sun in the tenth house in Leo showing strong ‘agni tattva’ which shows light [and camera], good career and karma while Hitler has a gaja-kesari of Juptier-Moon in 10H in Leo showing tremendous power as they lord the trines in navāṁśa. 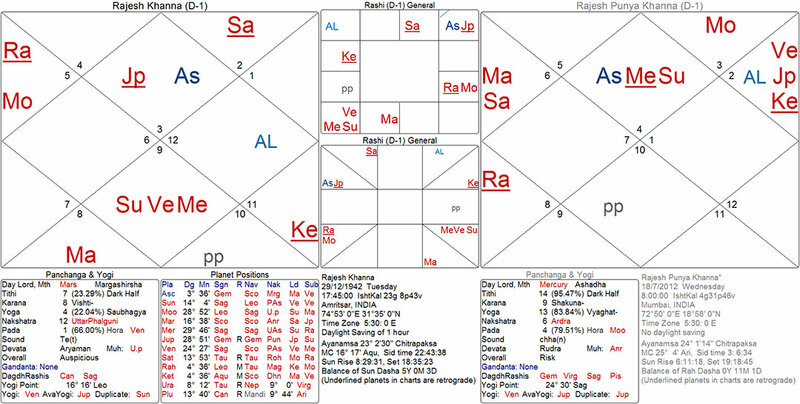 Rajesh Khanna has two planets Saturn and Rāhu in 7th house in digbala showing disturbed relationships but many blessings like children and marriage. This is further spoiled by Moon-Mercury in the 2nd house showing an endless stream of relationships. Adolf Hitler has the deadly battle of Mercury in maraṇa sthāna in 7th house with Rāhu showing uncommitted relationships and finally death on the day of marriage. It is clear that they are opposites in matters of the heart – Rajesh Khanna so full of love for all while Hitler only loved power. He was born ‘Jatin Arora’ on 29 Dec 1942 in Amritsar to biological parents Lala Hiranand and Chandrani Khanna who had migrated from pre-partitioned Pakistan. He was adopted by his wealthy maternal uncle Chunni Lal Khanna and wife Leela Wati. His biological father had worked as headmaster of the MC High School in Burewala, Vehari District, Punjab, Pakistan before immigrating to Amritsar while his adopting father (uncle) was a railway contractor. The ninth house Aquarius has two lords – both aspecting Aquarius and having a clear say. Saturn the first lord shows the biological father and being vargottama indicates good qualities of head and heart but being in the 12th house it shows poverty and many hardships including immigration as its dispositor Venus is in 7th bhāva. The ninth house co-lord Rāhu showing the adopting father. Being in Leo it shows a government related work while Rāhu shows the railways; conjoining the Moon it shows ‘related to mother’ and in third house ‘a brother’. Put the words together and we get ‘mothers brother who is in railway related government work’. In Dvādaśāṁśa, the ninth house Pisces has two lords – Ketu the first is in Pisces showing the biological father while Jupiter, the second-lord is in 11th house showing the adopting father as being related. Jupiter is also the 6th lord showing mother’s brother (3rd from 4th house). Finally ‘Mercury was adopted by Jupiter’. After adoption, he became Jatin Khanna and went to live in Mumbai suburb of Girgaum. There, he went to school and college with his great friend Ravi Kapoor. Both best friends from school and college choose a career in movies and both changed their names. Jatin Khanna changed name to ‘Rajesh Khanna’ on the advice of his uncle (adopting father) while Ravi Kapoor adopted the name ‘Jeetendra’. Name change seems to be a critical factor for success for an unstable Mercury. Even A.R.Rahman who has a similar Rāśi Chart yoga like Rajesh Khanna changed his name from Dilip Kumar to Allah-Rakha Rehman. In his four-decade career, he appeared in about 160 films, of which 106 had him as the solo lead hero and 22 were two hero projects. With the advent of Sun daśā his stars started setting just as the Sun sets in his horoscope. It’s strong placement in navāṁśa does prevent complete blackout as happens to many movie stars. It was a gradual fading away. Rajesh teamed up with Hrishikesh Mukherjee for the critically acclaimed offbeat films Bawarchi and Namak Haram. The quintessential romantic also did the intense Avishkar, directed by Basu Bhattacharya. But then age caught up and the star began fading away. Pyarelal of Laxmikant-Pyarelal duo quoted in an interview that “Rajesh Khanna was lucky for us and we were lucky for him too. From the 1969 Do Raaste to the 1986 Amrit, we gave hits together both as films and as music scores”. With the end of Sun daśā in 1986, his movie career ended. At the insistence of Rajiv Gandhi, he started campaigning for Congress Party from 1984. However with the advent of Moon daśā (1986-95) he really got deep into politics and social service. He fought the 1991 Lok Sabha elections for New Delhi seat and lost to L.K. Advani by a narrow margin of just 1589 votes after which Khanna stood on the ground at the counting station insisting that he had been cheated of a win. A by-election took place for the same New Delhi constituency in 1992 and Rajesh Khanna won by defeating BJP’s Shatrughan Sinha by 25,000 votes. The Moon normally gives success in the second attempt and this time too it was the second attempt that gave him success in elections. Moon in the sixth from āruḍha lagna and must be weak for rājayoga. It is weak in a duṣthāna from lagna but is not very weak being in Sagittarius navāṁśa. But its conjunction with a weak Mercury in navāṁśa and affliction by Rāhu does make it weak, which is good for rājayoga. Rajesh Khanna was a Member of Parliament for the Indian National Congress, during 1992-96 or most of Moon daśā. When Khanna was MP, he did not accept new acting assignments except the film Khudai (1994). After leaving parliament in Mars daśā, he was a political activist for the INC and campaigned for the party till the 2012 Punjab election. He moved to television in Mars daśā and played the main lead in two serials – Ittefaque and Apne Paraye during 2001-02. Mercury daśā tried to give him a return in 2008-09 but being in maraṇa kāraka sthāna, Mercury could not do much. Mercury shows a Viṣṇu theme as the movie name should indicate ‘Raghukul Reet Sada Chali Aayi’. The decline to B-grade films was inevitable. There was also ‘Wafa: A Deadly Love Story’ with Laila Khan in 2008 which bombed at the box-office. With Moon-Mercury yoga in the second from navāṁśa lagna and Mercury-Venus yoga in the 7th bhāva in rāśi chart, there was no dearth of women in his life. But fortunately for him the sign in which this happened, both in rāśi and navāṁśa, is Sagittarius owned by ‘broad-minded’ Jupiter. They loved him and were true to their love. Just the rare case of Anita Advani who claimed that she had been Khanna’s live-in partner, and sent a legal notice to his family members in 2012 asking for compensation. Amitabh Bachchan cited that Khanna’s last words were “time ho gaya hai! Pack Up!”. Bollywood’s original superstar – the unforgettable Rajesh Khanna – died in on Wednesday, 18 Jul, 2012 in Mumbai at home in his 70th year [Sudarśana Chakra Daśā 3rd bhāva with Rāhu]. The death was in the early hours of the day on Kṛṣṇa Caturdaśī tithi ruled by the lord of fifth bhāva Venus. This does indicate ‘śukra doṣa’ in the death chart and the immediate event of a former lover Anita Advani filing for compensation as live-in partner does allure to this śukra-doṣa (Venus affliction-flaw). 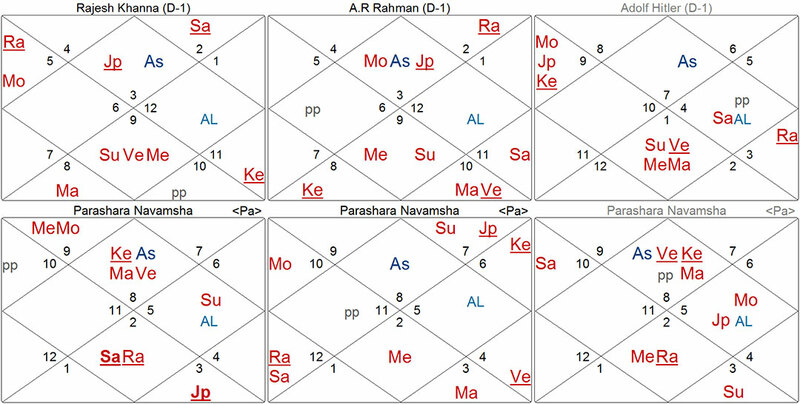 Third from Arudha has Mars in Rajesh’s chart. However, he died of Cancer. Sir why Moon should be weak for Raj yoga? and how Mercury is related to name change? natural benefics in 6h from Arudha give rajayoga when weak while natural malefics so placed must be strong. when i read your article i feel as if thats what my heart wants to read. I feel as if you know me inside out. I feel as if it was written specifically for me. So much I have received from you that I always feel like a hungry dog at the receiving end. Still anticipating more and more. I am and will always be obliged for blessing me with your vast ocean of knowledge. Even a drop somewhere here and there are more precious than any wealth in this world. Thank you so much respected Guruji for the answer. Excellent analysis with comparison so easy to understand and to compare why this was different from other like Herr Adolf Hitler was drawing the masses and people ready to do anything for the Fuhrer but both sexes and in the case of Mr Rajesh Khanna the women were mad to give the life even for him.Guruji you forgot to tell about Mr R Khanna disease due to the alcohol excess like many others for example Ludwig van Beethoven . Please shed some light . Thank’s a lot Guruji . Very much informative description of horoscope of a great legend of his time. As usual great work. Highly educative also. We are grateful for the educative post. Enlightening and educating treatment of Horoscope.Thanks for nice reading.